We are proud to present some Plush Puppy Products used for Dog Showing . Thank you for shopping at Pet Homes! We promise to bring you only the best quality materials and state of the art products, to insure your success in the Show Ring. Below is a short description of ecah product. Recommended For: Wonderful for bringing out the full glamour of the shine and colour as a final finish to breeds such as Pugs, Rottweilers, Boxers etc. Use as a last minute finish on saddles such as Afghans and American Cockers. Suitable for double coated breeds also. Brilliant spray coat finish and totally oil free. Wonderful for instant healthy looking shine. Recommended for light disentangling and as a spray polish for all groomed coats. Makes toplines and whites really shimmer. Can be applied directly to either dry or wet coats for disentangling. Excellent for quick brushing of flowing coats such as Afghans or use lightly on coat fringes on Salukis, Setters etc. How to apply: For an instant shine apply directly to a dry coat and lightly brush. Can be applied directly to either dry or wet coats for disentangling. Excellent for quick brushing of flowing coats such as Afghans or use lightly on coat fringes on Salukis, Setters etc. Recommended For: Particularly good for flowing coats that need wrapping e.g. Pekingese, Shih Tzus, Yorkshire Terriers etc. Any coat that needs moisturising such as Spaniels, Setters, Retrievers etc. A remarkable “leave in” product designed to moisturise all types of coats without leaving them greasy or feeling oily. This amazing formula really gets results. Brilliant for conditioning coats that cannot take a regular conditioner e.g. where you need to retain fullness, or coats that need a totally non greasy conditioning. Great for disentangling and reducing knots. How to apply: We recommend foaming about a golf ball sized amount to 1 cup of warm water in a Plush Puppy Spray Bottle. Shake well and spray onto coat lengths. Wrap as normal. For regular moisturising and rehydration, simply shake can well and apply a golf ball sized amount to hands. Spread through the coat. Comb, brush or groom as usual. DO NOT RINSE. LEAVE IN. 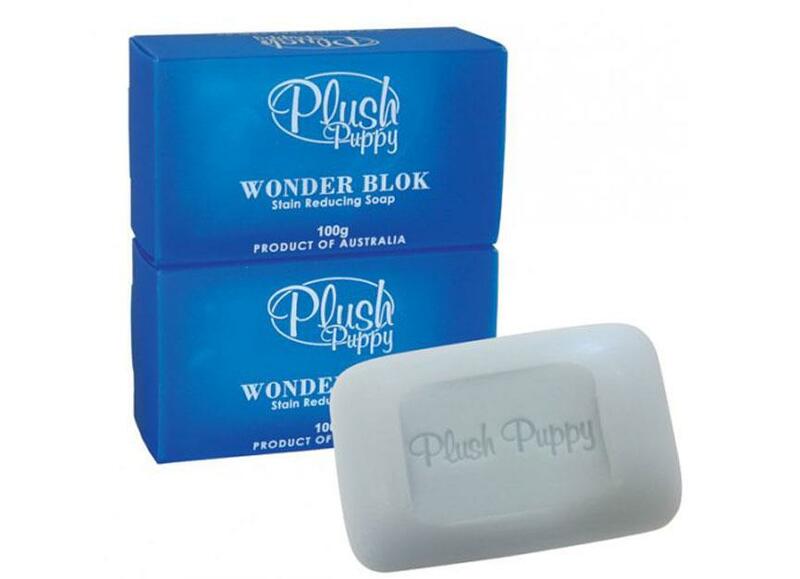 Plush Puppy WONDER BLOK is an innovative approach to traditional stain reducing. Directions: Wet coat and apply regularly to reduce staining. We called it FAST because one of the ingredients makes water evaporate quickly, so cutting down the time taken to blow dry. Our research has shown that it can take 50% less time to achieve the finished look. FAST is probably the most technically advanced formula in the Plush Puppy Range to date. Shampoo and towel dry thoroughly before applying FAST throughout coat including under layers, brush through. An innovative spray on Shampoo featuring henna extracts that imparts gloss and shine. Perfect for breeds that require texture to be maintained. e.g Weimaraners, Bulldogs, Rottweilers and most Terriers.